George Duffy (left), Executive Director, SCOPE Educational Services, presents a check for $10,000 to members of School-Business Partnerships of Long Island, Inc. (SBPLI) at the 5th Annual SBPLI Golf Outing. Also pictured (l-r) Deb Winter, FIRST® Robotics Director; Hans Zobel, Chairman; and Joani Madarash, Immediate Past Executive Director, SBPLI. 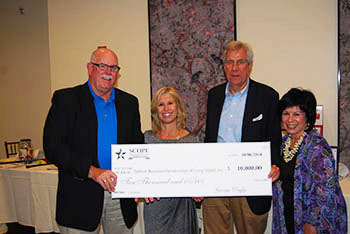 SCOPE Educational Services Executive Director George Duffy presented a donation in the amount of $10,000 to School-Business Partnerships of Long Island, Inc. (SBPLI) during the 5th Annual SBPLI Golf Outing, which was held on October 6 at Stonebridge Country Club in Smithtown. The money will be used to support SBPLI and its FIRST® (For Inspiration and Recognition of Science and Technology) robotics programs. SCOPE is a non-profit, private organization that was founded in 1964. It is chartered by the New York State Board of Regents and governed by a board of directors that includes school superintendents and college representatives. SCOPE works with school districts to help students and teachers address common concerns. SBPLI works hard to inspire students to pursue careers in science, technology, engineering and mathematics. It proudly sponsors and manages three unique FIRST® programs on Long Island including the FIRST® Robotics Competition, FIRST® LEGO League and Junior FIRST® LEGO League. For more information, visit www.sbpli.org.